Running in second for the majority of the race and shadowing tear-away Sam Walsh, Dumesny found himself at the pointy end of the field for the final restart of the race when leader Walsh looped his car in turn one and two. At the restart, Dumesny powered away to record his fourth win at the venue. Scoring his best finish at Valvoline Raceway, runner-up Mick Saller was superb throughout the race and was very much in contention for the entire 30-lap distance. Dropping back to as low as fourth in the second half of the race, Saller was strong and determined to get on the podium and did so in style. Completing the top three was Jackson Delamont. The newly engaged Delamont was on the pace right from the outset of the feature race and also had to fight back after falling back to fifth at the half-way point of the event. Rounding out the top five was Max Johnston, who has been putting in some strong performances of late and Warren Ferguson who stormed home in fifth after starting deep in the field for the feature race. Completing the top-10 was Luke Stirton in sixth who put in a very mature drive and came away with a personal best feature-race result, Daniel Sayre, Sam Walsh who salvaged a top-10 finish and valuable USC NSW points, Jeremy Cross and Danny Reidy. Brendan Scorgie, Jessie Attard who was in retro colours as he honoured his grandfather Terry Becker, Ben Atkinson, Daniel Cassidy, Max Dumesny, Grant Tunks, Blake Skipper, Peter Bourke, Michael Stewart, and Kyle Angel were the remaining finishers. Non-finishers were Jordyn Brazier, Troy Little, Alex Orr and Robbie Farr with the latter riding out a wild ride on the main straight. Thankfully Farr emerged unhurt, although very frustrated by the uncharacteristic crash. During the night, eight heat races were contested with wins going to Attard, Stirton, Delamont, Saller, Brazier, Farr, Mat Dumesny and Walsh. The B-Main saw Stewart grab the win ahead of Tunks, Angel and Bourke. Sadly for Marcus Dumesny, his night ended at turn one heat one when he endured a spectacular flip. Dumesny emerged unhurt but bitterly disappointed. Andrew Wright was the only other B-Main non-starter after flipping in his heat. He too was A-OK. 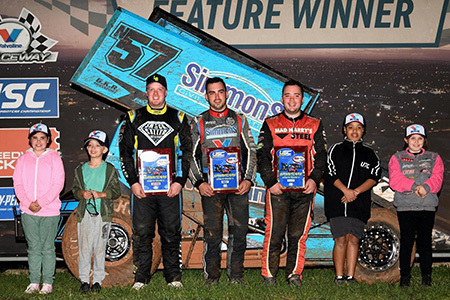 There are a couple of busy weeks ahead for the SANSW with the second Development Sprintcars event scheduled for next Saturday night followed by the famed Sid Hopping Shootout on November 24.